I agree. Take this and call it a winter. 12z nam looking very juicy at hr 30 here. May be a good run incoming. Pretty pumped to actually have a winter storm watch right now. 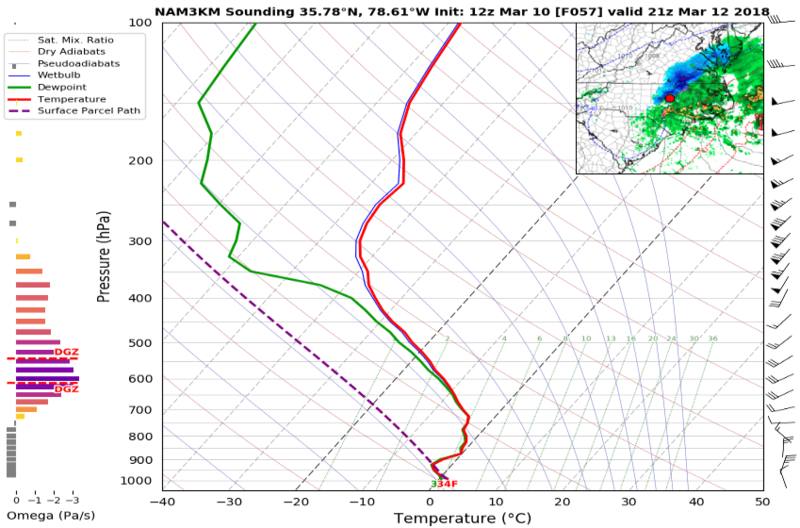 12Z NAM is a SOLID hit for southern/central VA and into the NC Foothills. Frosty, where you at bro? Here, just checking in. 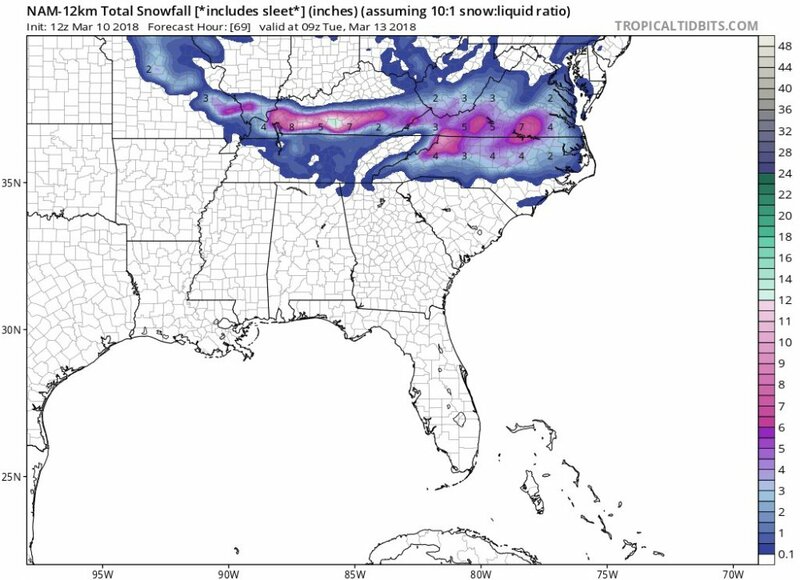 Any accumulations here on the Nam? Here's out to hour 69. Nice hit for central/northern NC into VA. I would still suspect much lower ratios (...everywhere); but I would gladly take one to two inches. 12Z GFS is even more juicy than its 6z run. Kind of funny to see it more juicy than the NAM. This close to start time and there are pretty significant differences that exist. For my area at least and the northern foothills as well, looks like a nice decent event is now being shown and in general agreement. 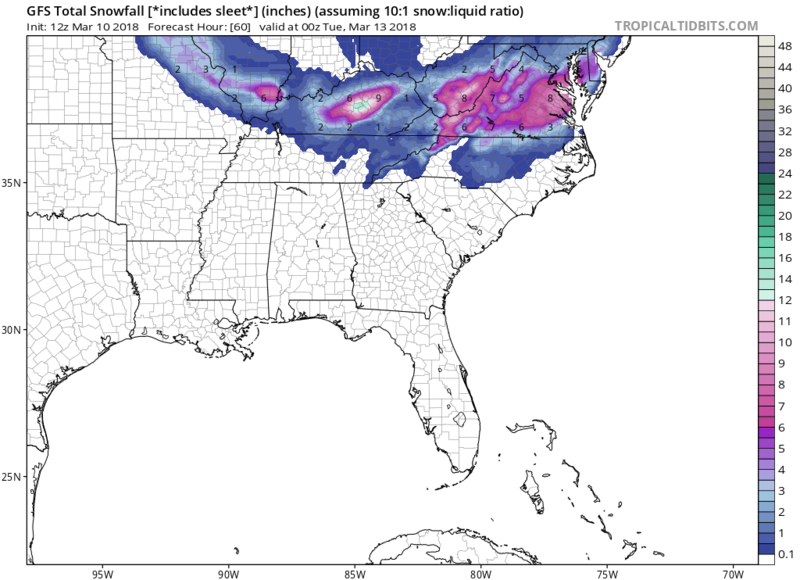 Edit: Man out to 54 now that is one heck of a nice little snowstorm for VA and now extending up into the Mid-Atlantic. 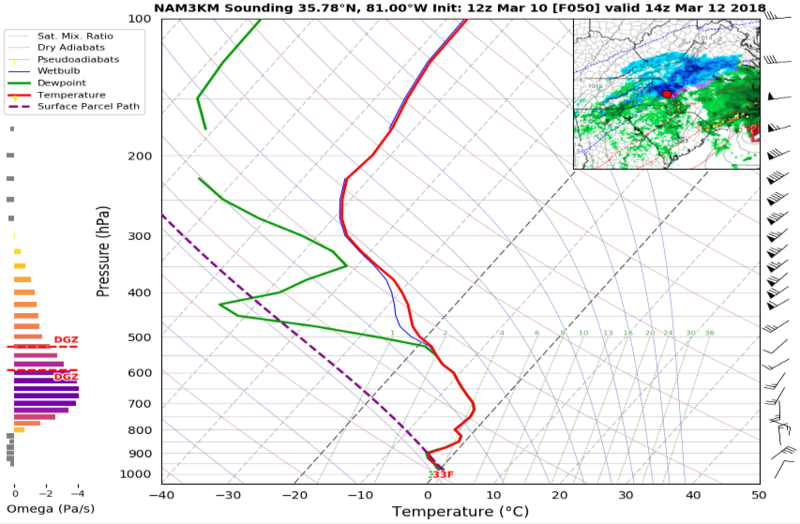 Hey grit...what do the soundings look like for RDU? 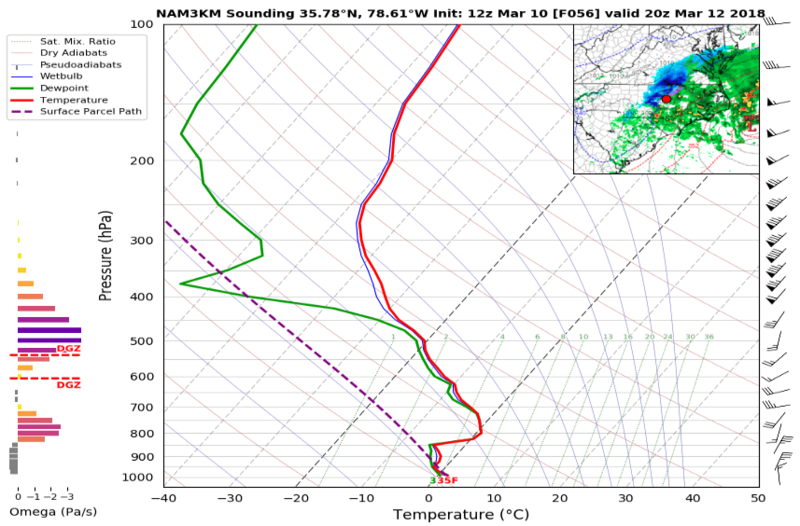 No way what the NAM is spitting out for accumulation is accurate...right? Sticking to my guns northern mtns see 12+ lollipops. 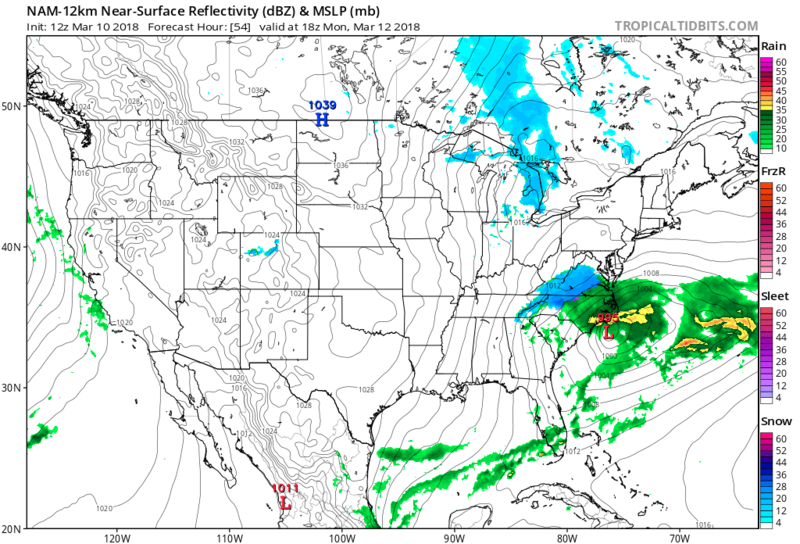 Also beleive the big lollipop winners outside of mtns will be somewhere writhing 50 miles north or south of the NC / VA state line from the foothills out into the coastal plain. Depends on exact track, but a deepening sub 980 l.p. riding our coastline will crank some rates no doubt. 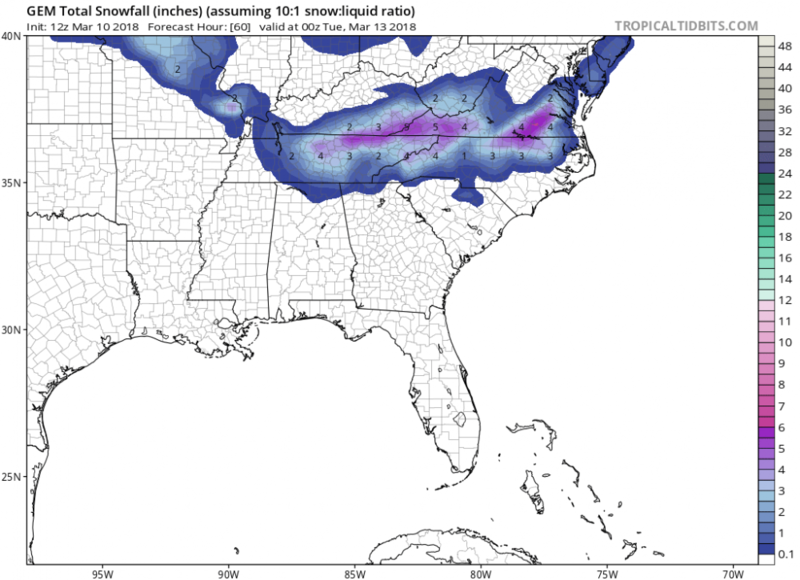 2m will be an issue, but rates is what will give accums outside mtns. I sure as heck hope so. It’s been an abysmal winter here in Boone imo. Only 2 “decent” storms at 4 and 5” respectfully. Would LOVE to see a double digit storm to end the season. I’ve noticed that too. It’s like someone puts a white glob over Surry County. But then we end up getting snow anyway. Still looks tough for the triangle IMO. Could see some fat wet flakes and things get a little slushy, but that's it. I'll be content with just seeing a few flakes Good way to end this winter IMO. 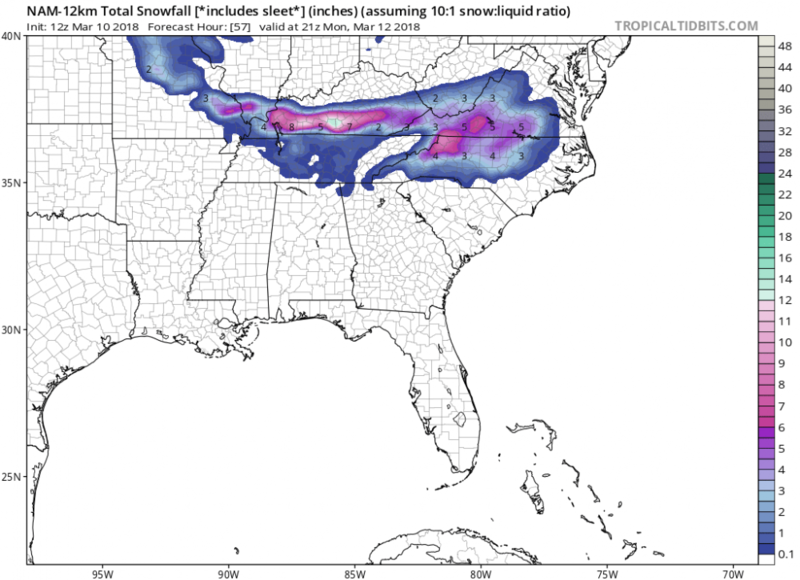 18z 3k Nam and gfs look awesome for southern VA. Looking to reel this storm in. Primary low takes a perfect track for our area for a deform band to pivot through. Meanwhile, Easter is looking cold. Is there something wrong with me that I relish the thought of all those who were relishing the early spring in February grumping their butts off? Yes, but that's not the reason.